Superior Surface Refinishing has the newest methods & systems for refinishing kitchen countertops, back splashes, ceramic tile, and cupboards. 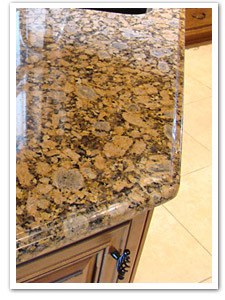 We now use a professional quality coating system to create a granite or blended multicolor finish. This process consists of spraying 2 coats of the XL Aerospace primer, 1 or 2 coats of the Multicolor or Stone Accents Coatings & then 3 coats of a high solids aliphatic acrylic urethane Clear top coat in satin or gloss finish. We can also do custom solid color finishes by spraying 2 coats of the XL Aerospace Primer which can be pretinted by our supplier in any Sherwin Williams Paint Color & then top coated with the satin or gloss aliphatic acrylic urethane. This solid color method is very popular for modern look finishes on cupboards as well. The most important thing to remember is whichever system and process you may like or choose both are a fraction of the cost of replacing your countertop and tile backsplash or cabinets. Your Superior Surface Refinishing representative will sit down with you in your home and help you decide what system will work best to meet your needs. We will do an estimate based on what look you want to create and pick out your colors you would like to use. If you have a sample or a picture of a granite or stone look you like, we can use it to choose a similar coating that can create this look for your kitchen. Normally you would go into a countertop installer or retailer and choose from what they have available. With Superior Surface Refinishing we come to your home and help you create that unique custom finish you have always wanted. We stock a wide range of Stone Accent & Multicolor options and can order custom color options as well. Our coatings can be applied to cupboards & cabinets as well. We can refinish them using our urethane hardened paint which is very durable or do a new stain & laquer finish in a wide variety of new modern stain colors. We also now offer a new option to replace your old cabinet doors & drawer fronts with new modern maple shaker style doors & drawer fronts and can use the modern hidden European style hinges regardless of the old style cabinet boxes you may have. The new style doors and drawer fronts can make your old kitchen cabinets look like a completely new kitchen at a fraction of the cost to replacing them. Call us for more details on cabinet refinishing. For more information on EP-ACRYLIC or MULTICOLOR & STONE ACCENTS finishes, check out Our Systems section. Check out our Why Refinish ? section for more information and the benefits of refinishing over remodelling and other renovation processes. Give us a call for your free estimate, We will exceed your expectations !